The term refers to rounded lumps of lymphatic tissue that forms a covering over the posterior area of the human tongue. One may call these the “Fourth tonsil,” after the two tonsils and adenoids located in the posterior part of the mouth. These are situated at the tongue base, on the dorsal surface. The tissue that constitutes this mass is dense and overlaid with stratified squamous epithelium. These are partly encircled by connective tissue. These tissue balls help protect the body. These are the seat of production of antibodies that are a part of the natural immune system and combats infections such as Lingual tonsillitis. In other words, these behave like an immunological organ. These physical structures often suffer an infection – a condition termed as “Lingual tonsillitis.” It is characterized by inflammation of the tonsils located at the tongue roots. The disease usually results from an entry of viruses or bacteria through the mouth via the food and water that is consumed. Although people of any age may have this condition, children aged between five and ten are the ones who most commonly suffer from this disorder. 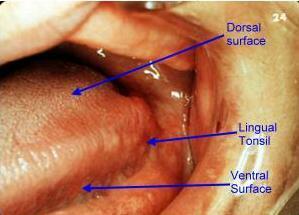 In such cases, the Lingual tonsils themselves produce antibodies that help fight the infection. Know how this tissue lump looks like with the help of these useful pictures.